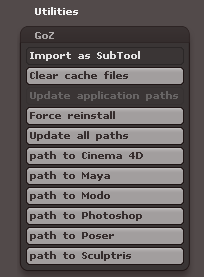 GoZ (pronounced Go-Zeeh) is a bridge between ZBrush and other applications. This allows for easy mesh and texture sharing between ZBrush and Sculptris, Photoshop, Poser, Carrara, DAZ Studio and many others. But how do we use it? Where is that magic button? And how do we select the target app? All will be revealed in this article. Just next to it you’ll find three options: All, Visible and R. Select either All or Visible to choose which objects will be sent via GoZ. This works with the current tool or a sub tool or a combination thereof. Nothing happens when you do, but ZBrush will remember it. Click the GoZ button and a dialogue window appears. 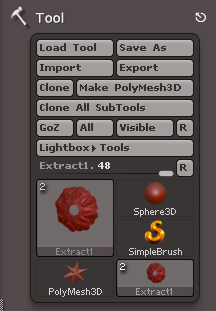 When you launch it for the first time ZBrush will search your hard drive for apps it knows, but it may get it wrong and say something like “Photoshop is not installed”. In which case, you can specify the paths to your apps under Preferences – GoZ. GoZ is a one-click operation to make it deliberately quick and easy to exchange data between two apps. Therefore, ZBrush will remember whatever app you’ve chosen last time and launch it automatically the next time you press that GoZ button. This may not be what you want. To change your target app, simply press the R button in the palette – NOT the R Button on your keyboard, as the documentation makes you believe. I mean the little R next to the All and Visible buttons in the Tool menu. Pick your target app, then hit GoZ and send your creation to another app instead. 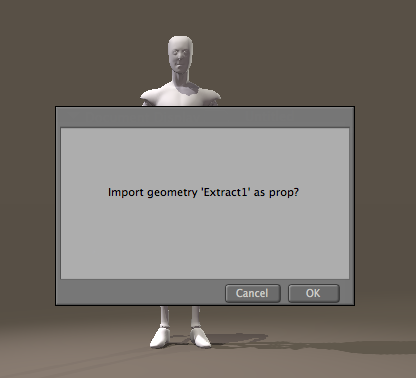 Your target app should launch automatically and may present you with a dialogue box to acknowledge the import (shown below is Poser Pro 2014). Really appreciated your tutorial on how to upgrade PP2014 to the GameDev version. I was lost till I found it. Was looking for your email address, but couldn’t find a link here, so just leaving a message for you. 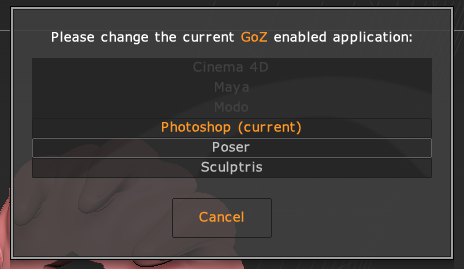 And speaking of the GameDev…since installing it I’ve notice when I use GoZ now, my figures export all parts [not just visible ones] to Zbrush…and if I GoZ back to Poser without turning any turned off parts back on, my morph gets jacked up. Have you heard why this change has been made with the PP2014 SR5? For instance I always keep my V4 eyebrows visibility turned off…and when I’d GoZ her…the brows were never visible in Z…and exporting her back was no problem. Now when I send her, she’s got brows and I have to turn them off to morph the face…then turn them back on before GoZ back to Poser of it jacks up the morph. Also, noticed that my Poser light presets are way freaking brighter now in preview mode. Actually have to turn my IBL visibility in OpenGL preview off in order to stand looking at my figure without my eyeballs catching on fire. Have you noticed any similar issues with the SR5? Drop me a line if you have time. Thanks again for the tut on GameDev install! Life-saver! Glad to hear the upgrade instructions were helpful! I must admit that I’ve never brought Victoria 4 over to ZBrush from Poser and back, so can’t comment on the eyebrow situation. I have noticed that Poser doesn’t like to exchange texture data – not sure why, it’s supposed to work, and it works fine from ZBrush to Carrara and DAZ Studio.